Add coffee powder to the upper container of the coffee filter. Add hot water to the filter and close immediately. Wait for 5 minutes and allow dicoction to drip in lower container..
Now the decoction is ready to use. Pour little decoction in a serving tumbler, add milk and sugar. Taken me back to Chennai days.. 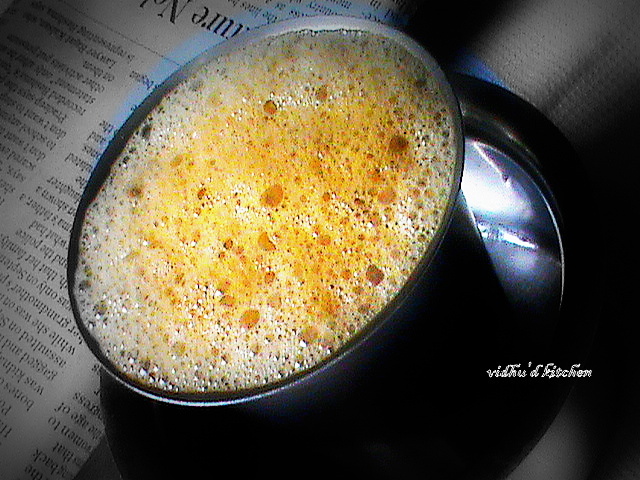 I am a big fan of filter kappi..I could actually smell the aroma of the coffee from the clicks..refreshing!!! Who can say no to Filter coffee. I love it. I remembers amma makes everyday fresh decotion. Do drop me in at http://ofmountainsandstreams.blogspot.com when you can.